For Karajan lovers this is most certainly a rare treat. It constitutes the only recorded document we have of him conducting Bach's Art of Fugue. It’s an abridged version consisting of Contrapunctus 1-12 only, and ending with Fuga a 3 Soggetti (Contrapunctus XIV). For some reason, he doesn’t follow Bach’s order, except for the first and last movements. I’m at a loss to explain this, and the booklet notes don’t enlighten us. Nevertheless it works very well and the movements seem to unfold logically. I’ve always been fond of Hermann Scherchen’s recording of this work, in an orchestration by Roger Vuataz, which he made for Decca in 1949 with Studio-Orchester Beromünster. It’s issued on Tahra (TAH 245/6) (nla). Though Scherchen’s version is complete and he adheres to Bach’s ordering, the conception and sound is remarkably similar, though his tempi are marginally broader than Karajan’s. In this 1944 radio broadcast, here receiving its first CD release, I hadn’t heard of the orchestra before. The excellent booklet notes by Michael Waiblinger set the context. At the time the recording was made, Karajan’s fortunes were temporarily on the wane. In 1942 he had married Anita Gutermann, heiress to a textile fortune, and with a Jewish grandfather. This incurred the opprobrium of the Nazi party, and his burgeoning career suffered as a result. Work became difficult to come by and he was forced to take what came along. 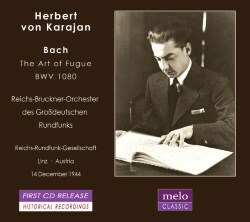 In 1944 he conducted the George Enescu Philharmonic Orchestra in Bucharest in the January, the Paris Radio Symphony Orchestra in April and May and the Reichs-Bruckner-Orchester des Grossdeutschen Rundfunks in Linz in July and December, the latter occasion including the Bach Art of Fugue we have here. The orchestra had Georg Ludwig Jochum (brother of Eugen) as its music director, a post he held from 1940 to 1945. Originally named the Städtisches Symphonieorchester, it was given a makeover in 1943, on the instructions of Hitler, and emerged as the Reichs-Bruckner-Orchester des Grossdeutschen Rundfunks. Jochum debuted with this newly transformed ensemble in April 1944, on the occasion of Hitler’s birthday. It attracted some big names, including Böhm, Knappertsbusch, Kabasta, Schuricht, Keilberth and Karajan. The broadcast we have here is one of the orchestra’s few recorded documents to have survived from around this time. The string sound is warm and appealing, and the venue is conducive to permitting the listener to hear the contrapuntal lines clearly and cleanly articulated. Karajan brings out the contrasts in the music, so it doesn’t feel like 45 minutes of all the same. Whilst Contrapunctus 1 and 3 are sedate and leisurely, 10 and 11 are light, sprightly and crisply articulated. I particularly like Contrapunctus 2, which has a sort of lilting gait. In Contrapunctus 9, Karajan delicately builds up the fugue from a solitary polyphonic line, with favourable results. Throughout he’s careful to avoid romantic excess. A thoroughly enjoyable performance and a valuable addition to the Karajan discography.